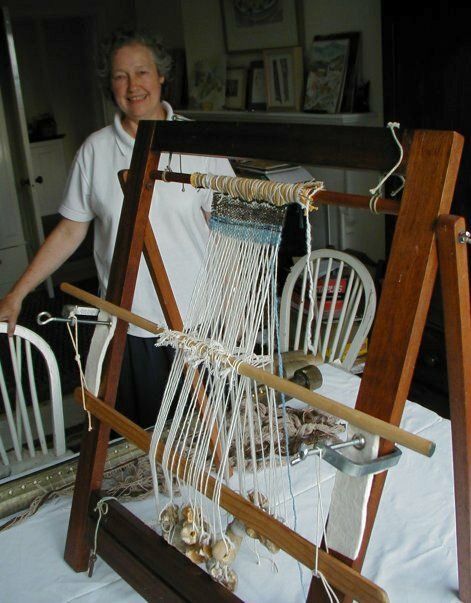 We used a warp weighted loom, as this is what would have been used at the time. 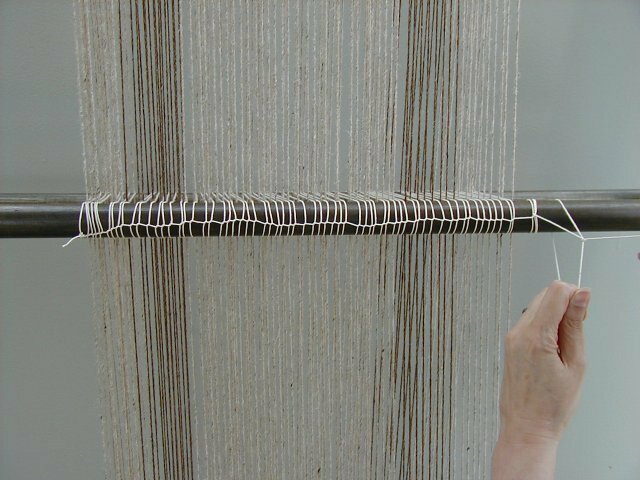 None of us had built or used one before, so this was something of an experiment, bt we did research it quite thoroughly, using the Internet and Martha Hoffmann's book, The Warp Weighted Loom. 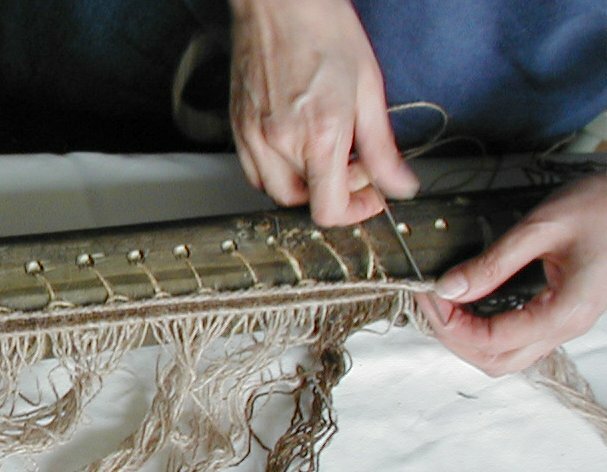 Next, the band has to be sewn onto the top beam of the WW loom. 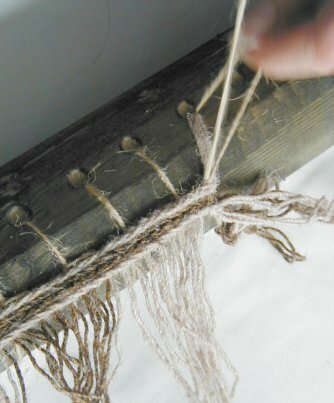 First it was positioned, then tied onto the beam to keep it in place while we sewed it into place. 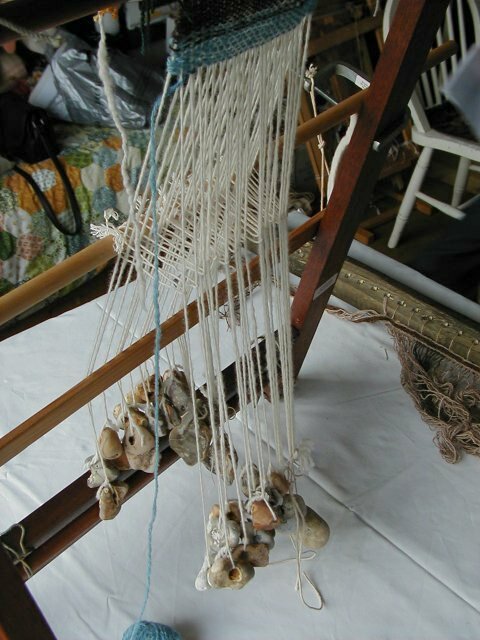 Once that was complete, it was tied off. 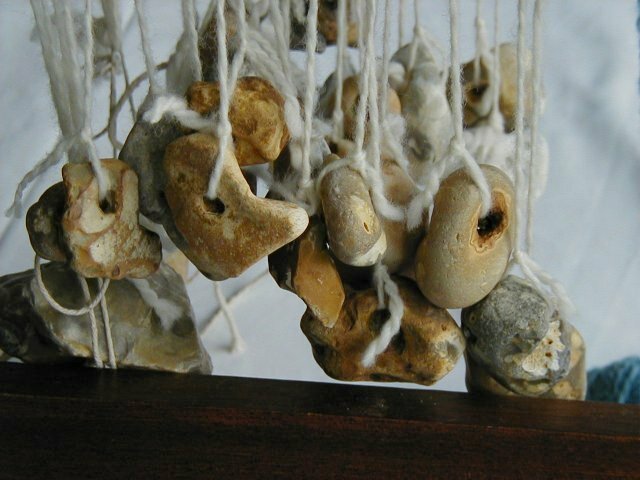 Here, is the attached band. 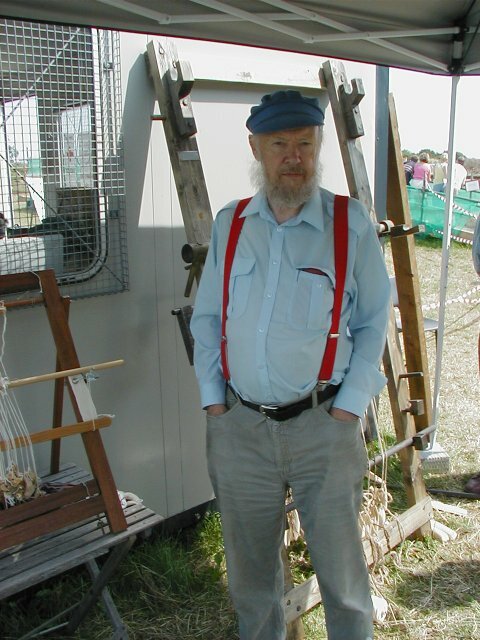 Here is Ken, who built the loom for us. 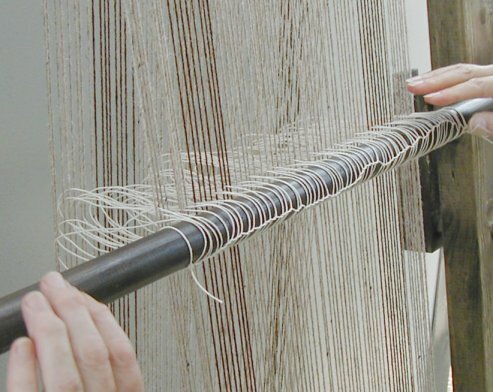 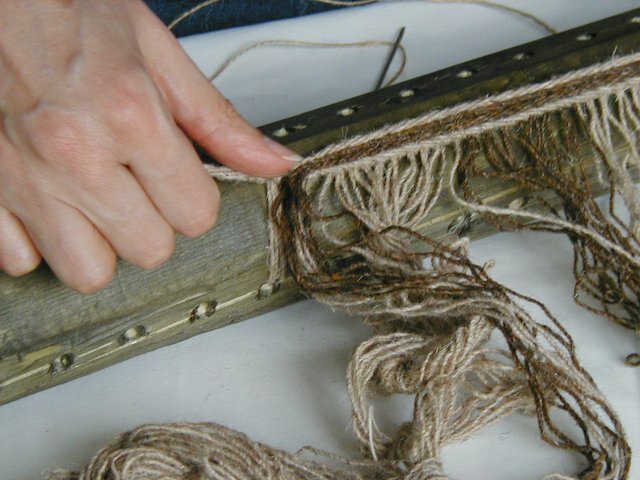 Once the loom is assembled with the warp attached, a crochet chain is made around the warp threads near the bottom of the warp tp space it and to prevent tanglilng. 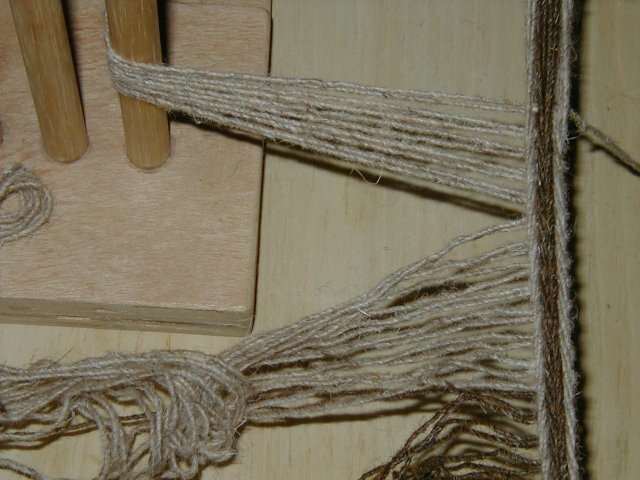 This is done separately for the back and front parts of the warps they need to move independently - back done, completed. 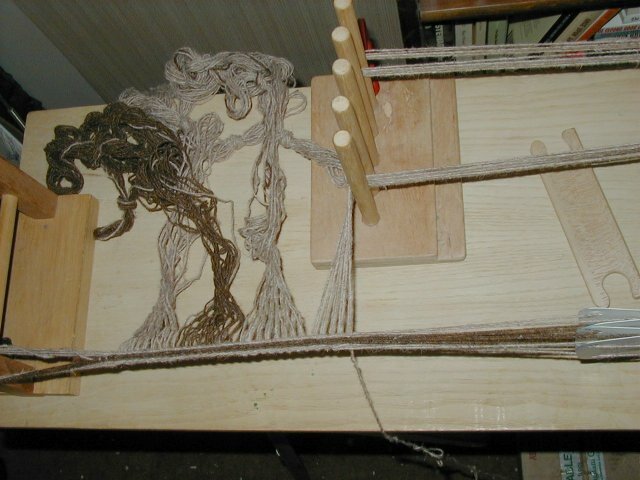 The next task was "knitting the heddles", whichis actually sewing cord around a rod and then around one of the warp threads (and a spacer rod behind), around the rod again, around the next thread and so on. 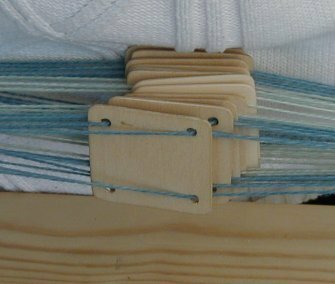 This needed some thought, and a lot of work but eventually it was finished and the spacer bar removed. 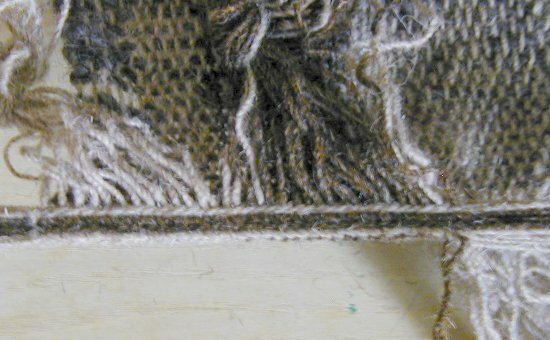 Finally we were able to form the second or "artificial" shed. 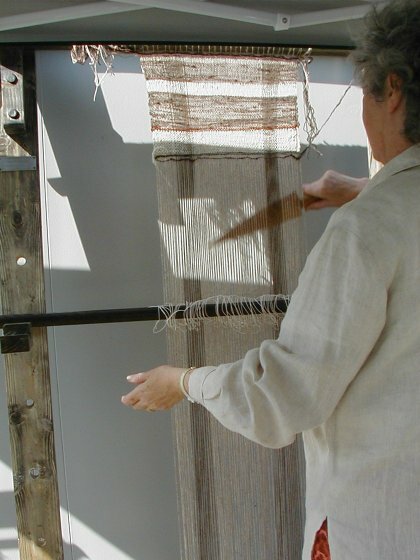 Now the weaving began. 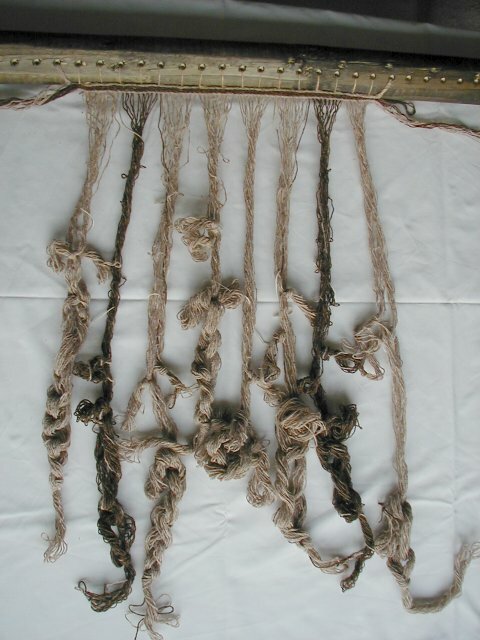 Here it is after the first three picks. 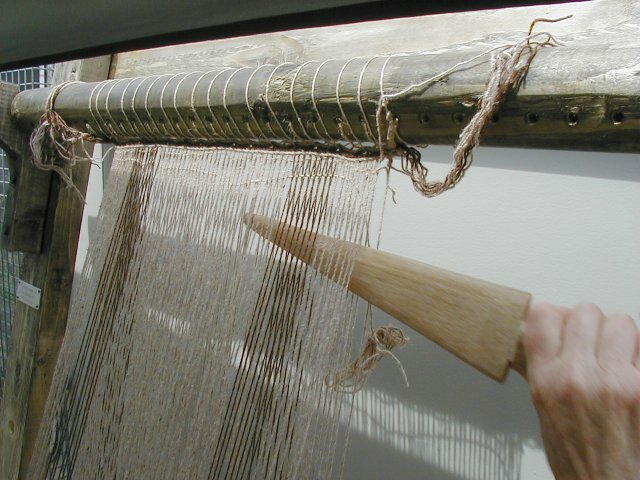 The warp has to be beaten upwards, which does not feel natural. 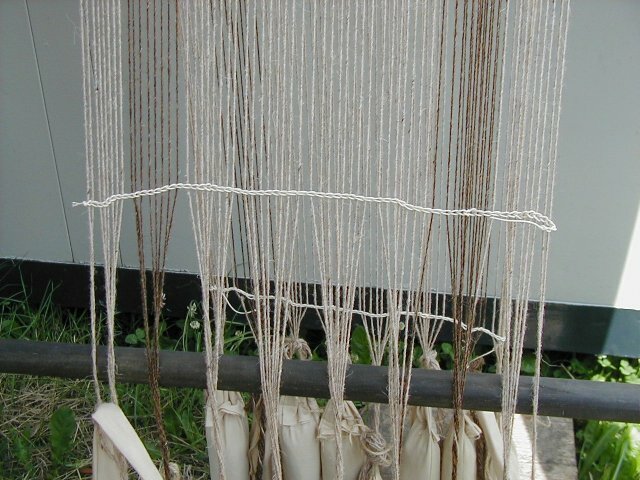 It was great to see the cloth steadily growing and growing. 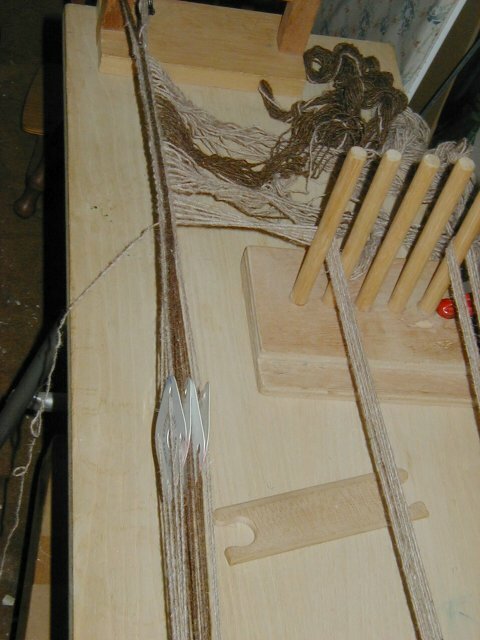 On day 2, progress continued with the WW loom. 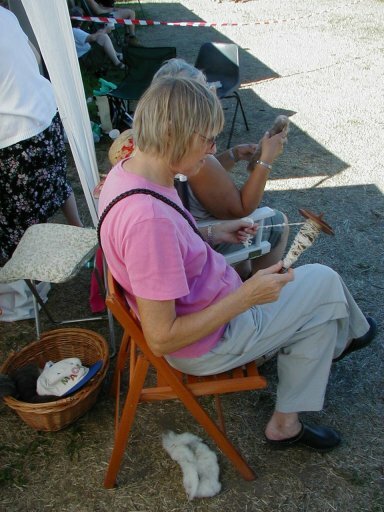 I don't have good pictures of the spindlers, but here they are taking a break while winding on their yarn - it was a long hot day! 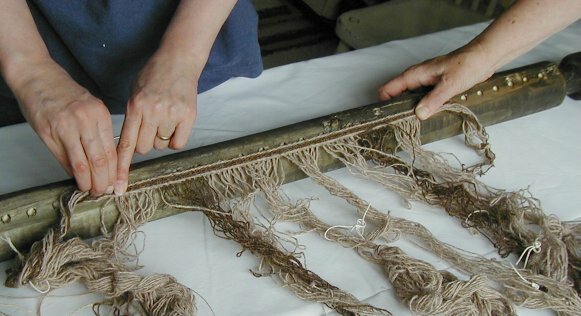 There were two tablet weaving warps in use. 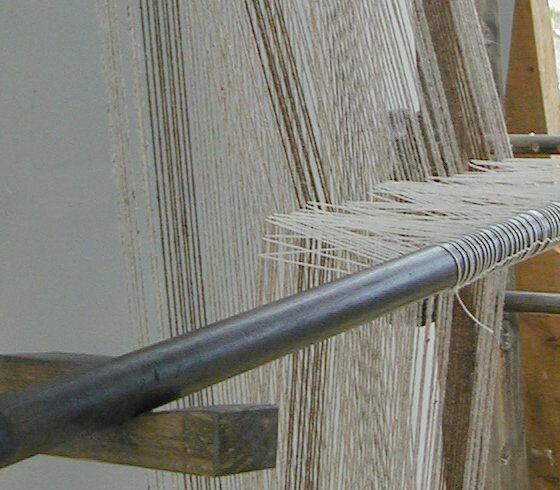 The furthest one in that picture was warped with a threaded-in pattern. 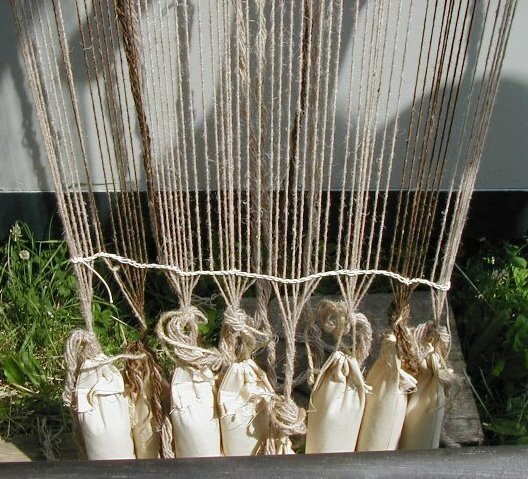 It had triangular tablets, as the archaeologists think that triangular objects they have found at the site were used for tablet weaving. 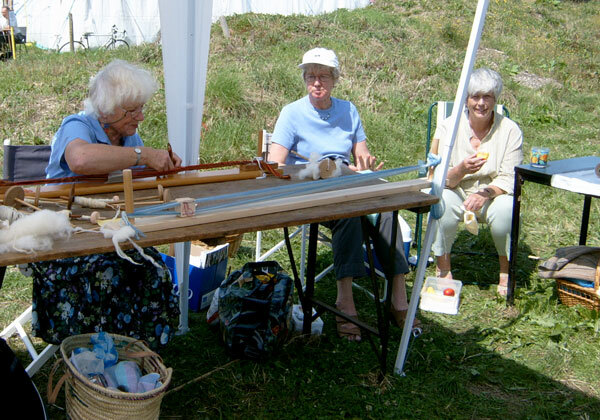 The guild's tablet weavers are sceptical as they are very awkward to use. 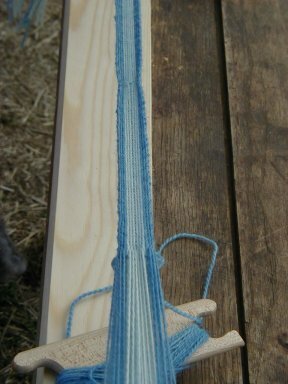 The other warp was indigo dyed wool and had home-made square wooden tablets. 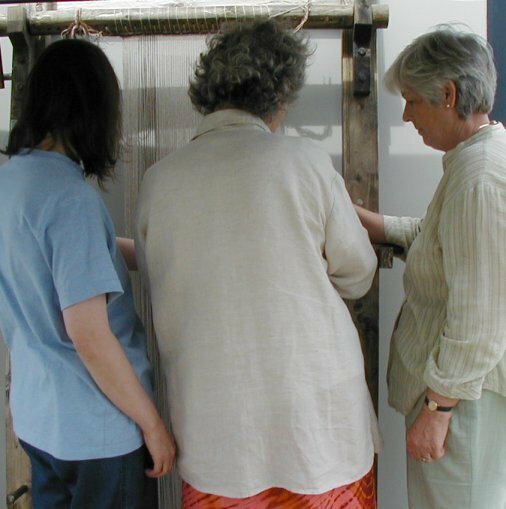 After the Open Days, we need to finish off the cloth. 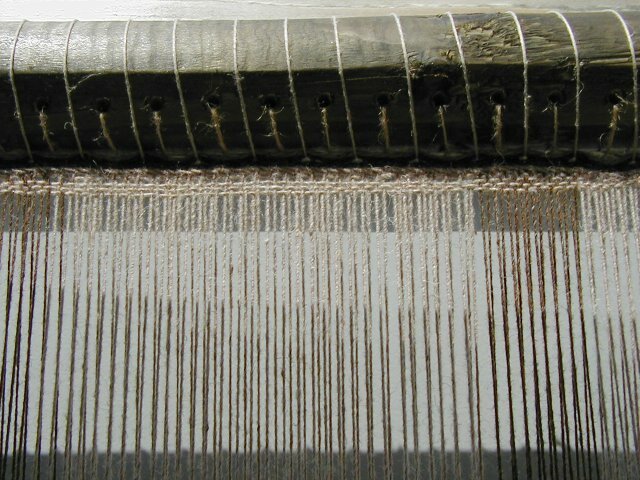 The usual way to finish cloth from a warp weighted loom is to repeat the tablet woven band across the bottom of the warp. 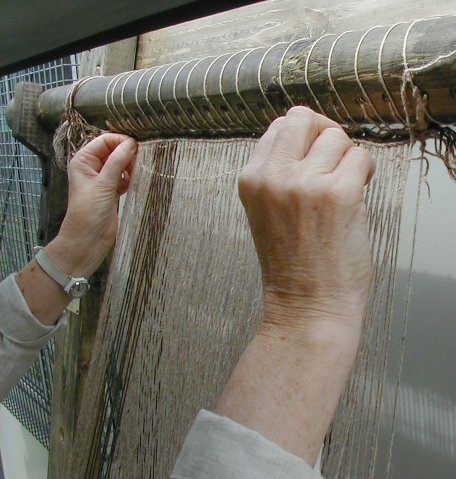 This can be done on the loom, but we chose the alternative method of cutting the cloth off the loom first. 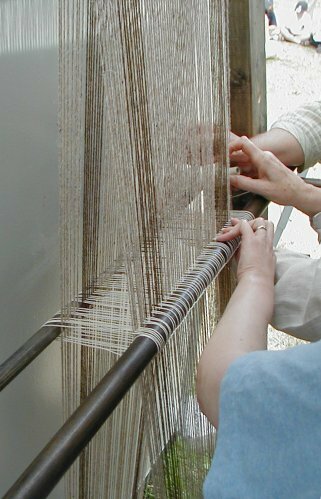 The band was woven in the same way as the starting band had been, but this time the ends of the warp threads were passed through the band as weft, then back through the next shed to secure the ends so they could be trimmed off. 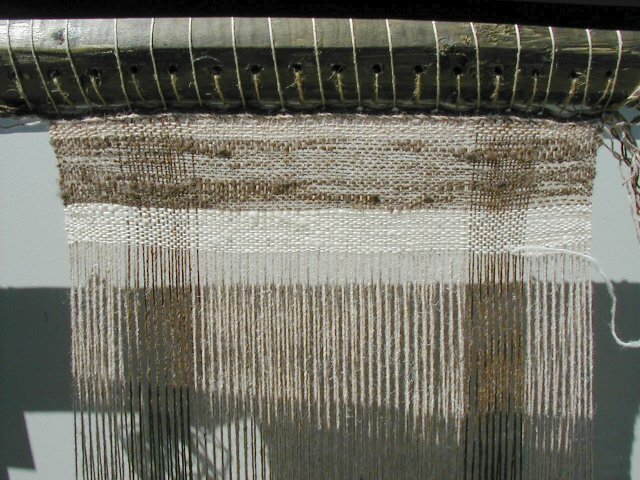 Now you are probably expecting to see a picture of the finished cloth. 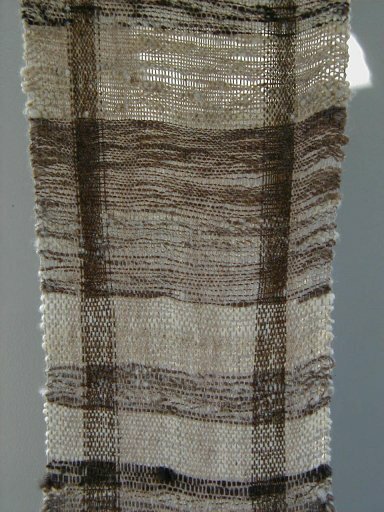 It has been finished, by washing and gently fulling, but I don't have photos of it yet ... soon, I hope!